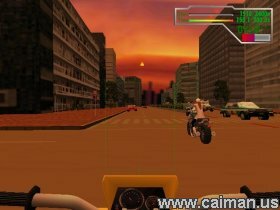 Caiman free games: Rider 2 by Crest Computer System. 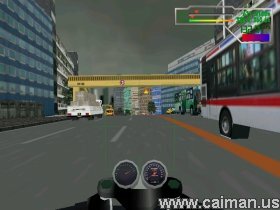 A Superb Motor Bike Simulator. This Bike simulator has plenty of realism that other games of this type do not have. You start of with a moped delivering goods to a destination on the other side of town while driving your bike through a busy suburban city, where people and other drivers go about there daily business. If you jump red lights or get seen speeding on certain parts you will get a ticket from the local Policeman that seems to hide. Every time you delivery the goods on time you can upgrade your bike to something different and faster. You use the mouse to drive your bikes and it works really well, you have a outlined box on the screen with a arrow, push the arrow to the top for max speed and pull it back to break. On the first screen you get pick the 3rd option to pick you first bike what is a moped. The game graphics and sound are ok and the gameplay is smooth just like riding a real bike. This game is a fun simulator and is a must for a try.